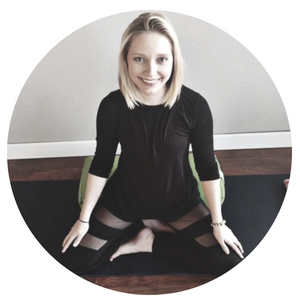 Caitlin began her yoga practice in 2010 as a supplement to her Bachelor of Arts in Dance. Originally, yoga was recommended to her to increase flexibility, strengthen the core, and elongate the muscles. However, she found the relaxation benefits helped tremendously in all aspects of her life. Caitlin went on to complete her yoga teacher training certification in 2016 and all her classes are centered around relaxation techniques. Her hope for her students it that they take some of these relaxation techniques into their everyday lives to be more present, connected with others, and feel more relaxed. Some of her other training areas include; kinesiology, psychology, the mind-body connection, Pilates, trigger point therapy, breath work and meditation techniques.